Scaphoid fracture accounts for about 75% of carpal bone injury. Common among young adults, rare in elderly and children. The most common part of scaphoid bone fractured is the waist, which is the narrowest part. 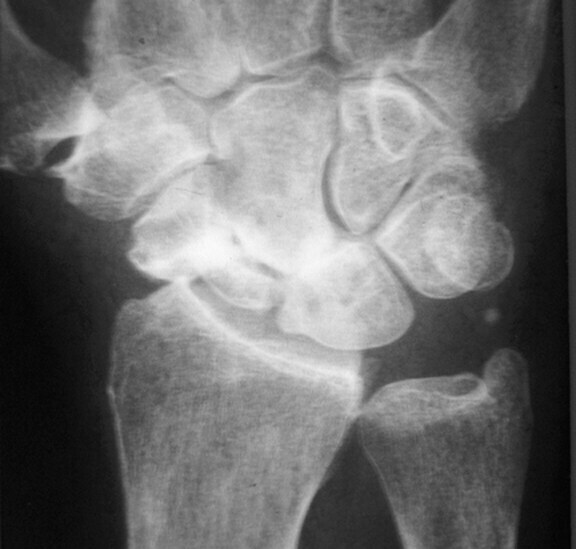 The most common complication associated with scaphoid fracture is non-union and avascular necrosis. Both of these complications are more common is case of fracture of scaphoid involving the proximal part. 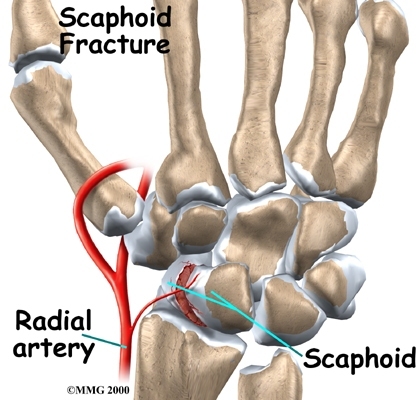 Since the arterial supply of the scaphoid diminishes as it approaches the proximal part. Note that 1% of distal fracture, 20% of mid-fracture and 40% of proximal fracture complicates as AVN and non-union. The mechanism of injury here is fall on an outstretched hand. The primary forces causing scaphoid fracture is dorsiflexion of the wrist joint and radial deviation. Such forces are transmitted through the two rows of carpal bones, and since scaphoid being part of both rows, it fractures through the waist, and rarely involves the tuberosity. In an adult, if there is a history of trauma as stated above, and later the patient complains of pain and swelling over the radial aspect of the wrist, especially over the anatomical snuff box (scaphoid fossa), together with tenderness of the scaphoid fossa, the diagnosis of scaphoid fracture is likely. However, tenderness over the anatomical snuff box can be due to wrist sprain as well. Hence to differentiate, palpate over the dorsal aspect of the scaphoid bone, and try eliciting tenderness over this region. In wrist sprain, there'll be no tenderness over this region. AP, lateral and 2 oblique views of the wrist joint is required for scaphoid fracture. The first few days after the fracture, the fracture line may not be visible. The patient should be asked for a follow up 2 weeks later, as X ray is taken again. After 2 weeks, the break in the scaphoid bone should appear. 2-3 months later, X ray of the wrist joint reveals increased bony density over the proximal part of scaphoid. Such feature is pathognomic of AVN of the scaphoid bone. Operative intervention needs to be done to prevent secondary degenerative osteoarthritis of the wrist joint. Either by doing surgical removal of the scaphoid bone and fusion of the proximal row to the distal row of the carpal bone, or by removing the proximal row of the scaphoid bone. 3 months later, X ray wrist taken and if there's no signs of union, a firm diagnosis of non-union of scaphoid fracture can be made. Usually, bone grafting is attempted to prevent secondary osteoarthritis. At first, if the clinical features are suggestive of a scaphoid fracture, but X ray is normal. Then is wise to ask the patient to come back after 2 weeks for another X ray to be taken. Mean time, cast immobilisation is applied from the upper forearm to the metacarpals, including the proximal phalanx of the thumb. The hand is immobilised in a way where the wrist is dorsiflexed, and the fingers in a glass-holding position. 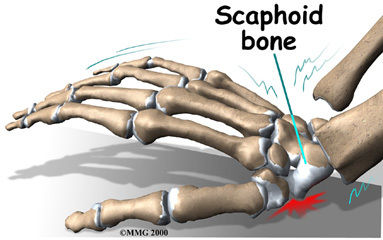 2 weeks later, if a fracture of confirmed, further treatment will depends on the type of scaphoid fracture. a) If it's a fracture involving the scaphoid's tuberosity, treatment is conservative which is similar to that of wrist sprain. Crepe bandage is applied to the wrist and allow early mobilisation. b) If it's a undisplaced fracture involving the waist, then the cast is maintained for another 8 weeks. 8 weeks later, if both clinical and radiologically, there is evidence of union, then the cast can be removed and wrist is allowed for mobilisation. If beyond the 8 weeks, there's no clinical or radiological evidence of union, cast should be re-applied and wait for another 6 weeks. However, if at that time there're signs of delayed union, internal fixation and bone grafting hastens the healing process. c) If it's a displaced fracture of the waist of scaphoid, treatment is ORIF using compression screws.